As so often in our history, our most professional and resolute infantry stages for the unknown. Most of these men were young, and inexperienced, but they had gone through the finest training for infantry that our country had to offer. Moreover, their officers and NCOs were almost all WWII veterans, victorious in bitter battle against the fine Japanese armies. All were volunteers. They all knew about the North Korean torture and mutilation of wounded US prisoners. But they also knew the Corps' tradition of not abandoning Marine wounded. In the 1st and 2nd Battles of the Naktong bulge, Inchon, the fighting around Seoul, the fight-out from Yudam-ni in the Reservoir, 50% or more of these men would be killed or wounded, lying in graves from Pusan to Chosin. But they would fight as a team, confident in themselves and in one another. In those coming campaigns, they would truly conduct themselves in the highest tradition of the United States Marine Corps. July 15, 1st Marine Brigade, left San Diego. 1stProvBgde was 6,534 strong. Jul 20, President Truman calls up the entire Organized Marine Reserve. Aug 2, 1st Marine Brigade arrives in Pusan. Aug 3, MAG 33 flying missions from carriers. Aug 7, Marines in first battle with North Koreans. First battle of the Naktong. There were many more battles to come. In the late 1940's, General Omar Bradley concluded that "amphibous operations are a thing of the past." The Truman Administration, guided by Bradley and the JCS, had cut the Fleet Marine Force to 34,000 officers and men, giving a ground fighting strength of only six infantry battalions, and a total Corps strength of 74,279 officers and men. Eliminated were the two Marine divisions which would have been able to meet and defeat the In Min Gun in the Pusan Perimeter. As it turned out, the single Marine RCT which still was capable of rapid deployment effectively saved the Perimeter, and South Korea, with its valliant defeats of the NK in the Naktong battles. 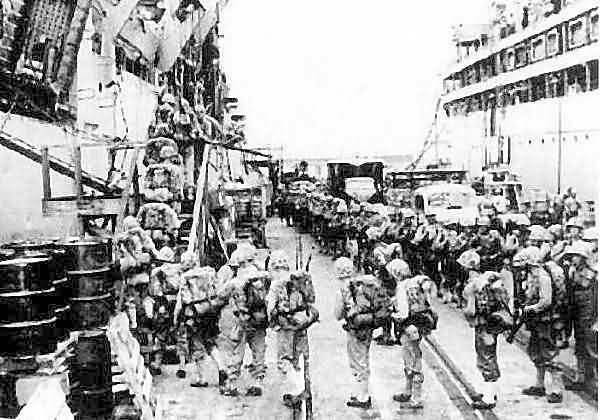 With these troops as their fighting edge, augmented by mobilizing the Marine Corps reserves, the whole 1st Marine Division landed at Inchon and devastated the NK army altogether. The Inchon assault succeeded mainly because of the audacity of MacArthur's plan of attack, and the speed of its execution. The NK were simply not yet prepared. The approaches were not yet commanded by their artillery, nor had they been mined. Their guns on Wolmi weren't yet well placed or numerous or well dug in. Their infantry weren't prepared or well dug in either. All these defenses were being started and, if finished, would have destroyed any invasion attempt. Only the over-extension of Eighth Army into North Korea, without proper staging or fall-back defenses in depth, lost the victory we had gained, when the Chinese entered the war. For Global Intelligence, MacArthur was required by chain of command to rely on Washington, and the CIA. As with their earlier evaluation that North Korea would not attack, CIA Intelligence was faulty. Against China's veteran guerilla armies preparation was much more vital than speed. 8th Army was ambushed and beaten. The Marines who crushed the North Koreans at Inchon were also ambushed, in the frozen wastes of Chosin, where they won a series of savagely fought tactical victories to survive our overwhelming strategic defeat.